Most people think of tea as only the drink from Asia coming from the Camellia sinensis plant. Familiar with tea only as black or green, they’re missing out on the huge varieties of teas drank around the world. Some are naturally caffeine free, like South America’s yerba mate, which has its own flavor profile and brewing techniques. Growing up with stories of the Boston Tea Party, many Americans believe all tea has to be imported. Many Canadians and Mexicans also believe tea only comes from other continents. But what if you could have your tea and drink it too? What if there was a local source for tea? What if you could buy tea leaves from a local grower or even grow a tea plant in your own back yard? Lucky for you, you can with yaupon tea. Yaupon is a plant that is native to the southeastern part of the United States. Native Americans and early settlers knew the benefits of yaupon and brewed it into a tasty drink. Native Americans also used dried yaupon leaves as a trade good. Don’t be fooled by yaupon’s Latin name, Ilex vomitoria, as it does not promote vomiting. Its Latin name is an unfortunate misnaming for although it was used in rituals including purification rituals, getting sick from it is not a normal reaction. Yaupon is considered an herbal tea because it doesn’t come from the Camellia sinensis plant. Instead, It comes from a plant that can grow up to 45 feet, which makes it a good-sized tree. The yaupon tree, also known as yaupon holly and cassina, is sometimes used as ornamental holly during the winter holiday season. The leaves remain green year round and bright red berries highlight the branches during the fall and winter. Spring and summer bring bees and butterflies to the clusters of small white flowers. Birds and other mammals eat the red berries produced from the flowers. Where Can You Buy Yaupon Tea? Yaupon tea and traditional tea (from the Camellia sinensis plant) are actually quite similar. There are differences between yaupon tea and traditional tea. Yaupon has less caffeine by weight. Yaupon has .65 – .85% caffeine content while traditional black tea has a little more than 3% caffeine. Yaupon has fewer tannins than traditional tea. This means yaupon has a less tart or astringent flavor than black tea. To get a stronger tea flavor, you can brew yaupon longer or use boiling water. It’s easier to find traditional green and black tea in your local supermarket. Yaupon remains a specialty tea. Dried and roasted yaupon tea can be purchased from a few growers in the United States. However, the good news is that if you have a green thumb, you could buy, plant, and grow your own yaupon. Steep for 4-7 minutes. The longer the steep; the stronger the brew. Remove the tea leaves or strain the tea into a jar or pitcher. If you like your iced tea sweet, add sweetener at this time. 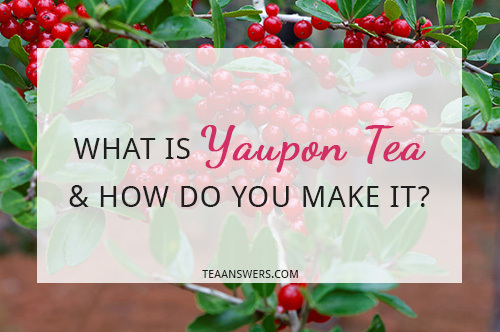 I hope you enjoy the benefits of drinking yaupon tea as much as I do! Nice article on yaupon. To make your own yaupon from the leaves just roast them in an oven at around 300f. Experiment with the different flavors as it turns from green to dark brown. Roasting time varies depending on moisture content in the leaves. Thanks for the great information Jason!